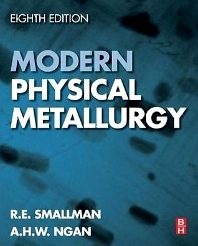 Modern Physical Metallurgy describes, in a very readable form, the fundamental principles of physical metallurgy and the basic techniques for assessing microstructure. This book enables you to understand the properties and applications of metals and alloys at a deeper level than that provided in an introductory materials course. The eighth edition of this classic text has been updated to provide a balanced coverage of properties, characterization, phase transformations, crystal structure, and corrosion not available in other texts, and includes updated illustrations along with extensive new real-world examples and homework problems.